HOUSTON -- Toward the end of the night, needing just one assist for a triple-double, James Harden turned into what he normally has been this year: playmaker. His lob pass to Montrezl Harrell led to a thundering dunk, giving him his 10th assist, and a nice little bow in the Houston Rockets' 101-91 victory over the Washington Wizards on Monday night. Harden picked up his ninth triple-double of the season and 18th of his career. He became the first player in franchise history to go three consecutive games with a triple-double. And while Harden recorded 23 points, 10 rebounds and 10 assists, making them sound like it’s going to be a common occurrence, he didn’t have his best game. He missed 9 of 11 shots in the first half, including going 0-for-5 from 3-point range. His final totals were 6-for-24 from the field and 2-for-11 on 3-point attempts. But Harden is so much more than shots -- he’s a passer, rebounder and a man who takes on double-teams, forcing defenses to leave somebody open. That somebody was Eric Gordon. He scored a season-high 31 points as he made six 3s and was 11-of-18 from the field. If we’re noticing anything about this Rockets team, which is 27-9 heading into a showdown against Oklahoma City on Thursday night, it's that other players contribute to the cause. Houston trailed by as many as 15 points in the first half and 12 in the third quarter when it went on a burst, as Harden played facilitator. Gordon went on a personal 8-2 run, bringing the Rockets from within eight to two in the late stages of the third quarter. Nene had a personal run himself, 6-0, which included a key block on an Otto Porter Jr. shot attempt. Two of the buckets -- a dunk and a layup -- came courtesy of Harden passes. When the third quarter ended, Houston had taken an eight-point lead, and coach Mike D’Antoni kept Harden in the game to start the fourth. D’Antoni believes you need to stack wins so you can control your own destiny late in the season when it comes to playoff seedings, and knocking off the Wizards -- winners of four of five games -- meant another statement. And when Washington trimmed its deficit to four on a Bradley Beal jumper with 6:32 remaining, Harden needed to rest. 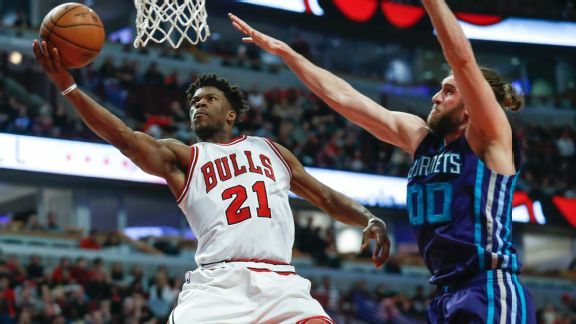 The Bulls' star became the eighth player this season to crack the 50-point mark. Houston missed its next five shots as Harden sat, and when Markieff Morris scored on a layup to tie the game at 82, it was time for Harden to return. Houston got more shots from Gordon in the fourth, his 3 with 4:29 left gave the Rockets the lead for good, and another one with 2:14 remaining pushed the lead to eight. Ryan Anderson had a nice block on a Marcin Gortat jumper with 1:30 left that put away this competitive game. All that was left was for Harden to get his triple-double, which he did with 10.4 seconds to play on the lob to Harrell. Houston finished December 15-2, outscoring its opponents by 12.8 points per game and recorded 2,056 points, becoming the first team to score over 2,000 points in a month since Golden State in March 1992. If last month showed us anything, the Rockets are about Harden. But when he’s off, as he was on Monday night, others can produce and push this team to an elite level. So if you want to say the Rockets are title contenders, that’s fine given how well they’ve played.